Dhanalakshmi represents wealth in eight aspects of ashtalakshmi. Dhana lakshmi is one of the aspect of wealth in the Ashta lakshmis. Dhana meaning Wealth. 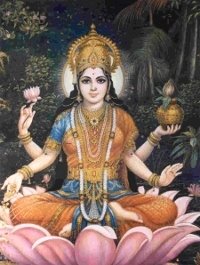 In few images, she sites in padmasana posture on Lotus flower and appears with orange color sari with ornaments and has six hands. Pouring gold coins from two hands.